These wings were delicious. Trust me. Yesterday, I covered the National Buffalo Chicken Wing Festival, held at Coca-Cola Field in Buffalo, N.Y. The event was exactly what it sounds like: 20-odd restaurants, both local and national, offering up 40 tons of wings to hungry attendees from 35 countries and almost every state. Flavors ranged from the traditional Frank’s Hot Sauce and butter recipe (although the original, Anchor Bar, wouldn’t tell me exactly what was it that made their wings the best, I gave it the ol’ investigative journalism try) to peanut butter and jelly and hot cocoa, from Abigail’s Restaurant of Waterloo, N.Y. Want a lime and cilantro wing? No problem. How about a Thai garlic? Sure, right this way. The offerings didn’t stop at wings, either. Costanzo’s bakery had a chicken wing roll that made one heckova chicken sandwich and Danny’s Buffalo Cuisine served up the original chicken wing soup. According to Dan Prenoveau, the manager of the restaurant that birthed that creation, it’s all in the texture. And you know? He’s not wrong. The soup is chunky, chewy and blue-cheesy, with that signature chicken wing heat we all know and love. The secret? Dan wasn’t telling, but I bet it involves butter. The peanut butter and jelly wings, according to adventurous taster Dan Kaufman, could have had more of that “stick to the roof of your mouth” savory, but they did the trick. Kaufman wanted to gnaw the peanut butter off the roof of his mouth like a dog, and said he knew of a place that had a better peanut butter wing than the Abigail’s offering. As for me, I declined his offer of a bite. I’ll keep my Franks and butter, thanks. Tim Kilber, originally of Buffalo and now living in Westminster, MD said that the hot chocolate wings tasted “like someone poured hot chocolate on a wing. Sure, Tim. I’ll take your word for it, too. Nadine and David Puchala of Rochester, N.Y. took home the gold for expert Wing Fest attendees. The couple brought their two daughters, Michelle and Raegan to the festival they’ve made their Labor Day tradition, every year. This group was set to go, with a card table they’d equipped with camp chairs, coozies for beverages and best of all, the schedule of events and offerings they wanted to try highlighted and duct taped to their table. David said he’s met people from 45 different states, including some coaches from his favorite sport, roller derby. Although he had only chowed down on 10 wings when I met him, he assured me the crew was primed and ready to take down much more than that, by the time the event wrapped up at 9 that night. I didn’t check back, but judging by the overflowing garbage can near where their table was set up, I don’t think we have any reason to be dissapointed in the Puchalas, this year. But eating wasn’t the only order of the day. Culinary contenders went bobbing for chicken wings in a kiddie pool filled with blue cheese (chunky, of course) and eating contests ranged from the amateur to the expert levels, including a “buffet bowl,” in which expert eaters from all over the country chowed down on two slices of pizza, a beef on weck three beef on weck sandwiches and a pile of boneless wings. Patrick Broadwater of Buffalo and his friend Joe Onderko of New Wilmington, Pa. entered the amateur wing-eating contest for the first time, this year. The pair has shared many a hefty meal, since their college days, and egged each other on to enter the contest. Although neither came in with an eating strategy, per se, they prepped by watching the Fourth of July eating contests on TV and fasting before the contest, to keep the edge of hunger sharp. The pair wouldn’t share their battle hymn, but did admit that their wives didn’t want to join them, at the contest. I couldn’t imagine why (until I stuck my lens and my stomach perilously close to the eaters, later that afternoon). “They said they’d rather do something else. Anything else,” Onderko confessed. Although the pair was bested in the contest, they weren’t deterred. Rumor has it, either could return next year, no that they’ve had their moment on the platform. Sarah Parkington, a Yahoo employee from Chicago, Ill. got down and dirty during the bobbing for chicken wings contest, after her Buffalo-native boyfriend and self-proclaimed “king of wings” Chris Behm “showed her the light,” as she put it. The only girl in the contest, she dominated the competition, digging out 57 percent of the wings. Blue cheese flew as fast and furious as the wings themselves, and the participants may have had more sauce on their faces than in the pool, by the time it was all over. Your city goes bobbing for apples in water? Novices. In Buffalo, we wear goggles and take blue cheese to the face. It’s a heart-healthy sport. Promise. I have to say, though, the most heartwarming story of the day award goes to Brehm’s parents, Lynn and Michael. The pair met at the Anchor Bar in 1971, when Lynn worked at the Armed Forces Recruiting Station next door and Michael was in the coast guard. The couple came to the festival to cheer on Parkington and sample the wings that brought them together, all those years ago. “It’s in my blood,” their son Chris said, when asked why he brought his lady to his hometown for the contest. Although he said Anchor Bar wings are his favorite “on the entire planet,” he allowed that Chicago does have a few offerings that aren’t as bad as he’d expected. He also pointed out that he’d happily take on Drew Cerza, the founder of the festival and the Wing King, for his fabled crown and wing-shaped scepter. “I didn’t just put on a crown and give myself a title,” he said, pulling out some good, old-fashioned smack talk for the occasion. “I could go up against him in a wing contest, any day. And I’ll win, too.” That contest never came to fruiton, as far as we know. As for Cerza, he said that he used to be wing purist, but has branched out, since he made what he calls “the iconic food of Buffalo” his profession, his calling and his creed. Cerza said it was too hot for his customary crown, but was wearing bright orange (wing-colored) shoes, to compensate. He called it unintentional, but one could suspect the wings have just gotten so deep into his psyche, he’s started picking wing-colored clothes without thinking. In your blood, Brehm? Cerza’s got the shoes, to prove it. We’ll be waiting for the showdown. In Buffalo, we’re a passionate people. If we’re known for one thing (other than our weather, of course) it’s our wings. 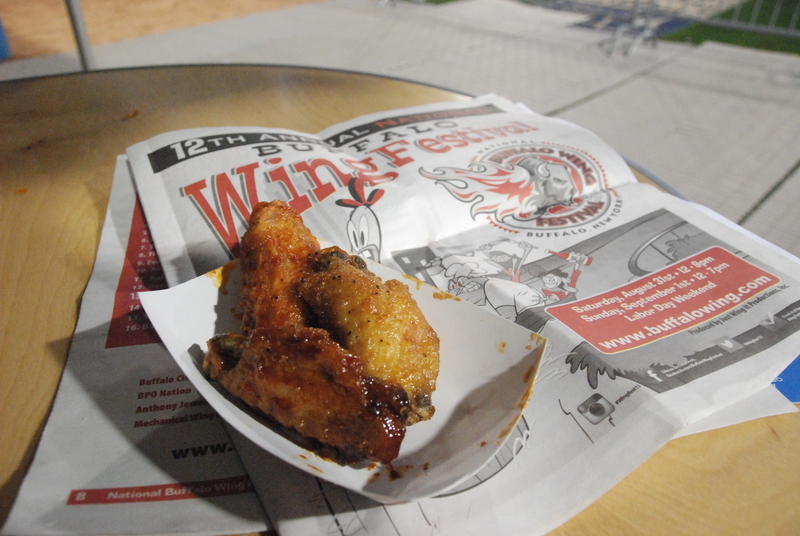 At the Wing Fest, we get to trot out our favorite food in all its greasy, gloppy glory. If you’ve got to be known for something, you could do worse than a deep-fried, spicy-sauced animal part most people would never think to eat. As I edited my photos and compiled my notes, I thought about what makes the National Chicken Wing Festival so great. Sure, there were professionals stuffing their faces with chicken wings, beef on weck (our other famous food, but we’ll cover that another time) and pizza, in not one, but two separate eating contests. There were wings galore, celebrity sightings, book-signings, cooking contests and all the glitz and glamor that has garnered the interest of national news outlets for the spectacle as much as the quality of the offerings. But for me, it’s the people like the Brehms and the Puchalas that make a festival like this one worthwhile. The people who came together or came to town in search of a common goal: to enjoy a food they love with people who love them, and it, just as much. Now if that’s not something to be proud of America, I don’t know what is. I really wish I had known about this festival! I would seriously consider taking the 7 hour drive to go.